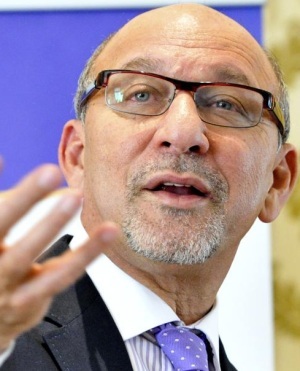 Former Finance Minister Trevor Manuel has thrown down the gauntlet to the EFF, calling for the retraction of a "racist" and "libellous" statement it made in relation to the appointment of new SARS boss Edward Kieswetter. Failing to do so would result in legal action, he said. On Wednesday, the Economic Freedom Fighters issued a statement containing various allegations against both Kieswetter and Manuel - among them that the two were related and had a close business relationship. Manuel was the head of the selection panel appointed by Finance Minister Tito Mboweni, which was tasked with interviewing potential candidates for the top job at the SA Revenue Service (SARS). The Finance Ministry later on Wednesday announced that Kieswetter had been appointed as the new SARS commissioner, effective on May 1. But in a terse statement on Thursday, where Manuel referred to the EFF as "bullies" and specifically referenced EFF MP Mbuyiseni Ndlozi, he said their statement was "false", "racist" and "libellous". "I will not be abused by schoolyard bullies," he said, saying that the EFF needed to provide proof of the allegations they had levelled against him. He said it was "racist" of the EFF to assume that because both he and Kieswetter were classified as coloured under apartheid that they must be related. "Only a mind warped into destruction by apartheid can ever suggest blood-ties between two individuals classified coloured by the apartheid regime, when the only connective tissue is racial classification," he said. Manuel also went on to say that there was no evidence of a business relationship between him and Kieswetter and that the onus was on the EFF to prove their claim.